Foreign direct investment (FDI) commitments in the first quarter of 2019 ­totalled $10.8 billion, the best first-quarterly performance to date, and soaring 86.2 per cent on-year, according to a report by the Foreign Investment Agency (FIA) under the ­Ministry of Planning and ­Investment. Foreign investors have poured money across 18 fields and ­sectors, in which manufacturing and processing continued to attract substantial attention, with investment ­capital of $8.4 ­billion, ­accounting for 77.7 per cent of total FDI approvals. Especially, real estate was the second-most heavily invested area, with $778.2 million, or 7.2 per cent of the total registered capital. In the property sector, some big firms have made a splash. 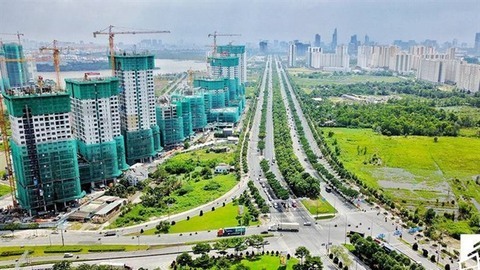 For example, VinaCapital ­Opportunity Fund Limited transferred 34.18 per cent of ­interest in Green Park Estate, a 15.7 hectare mixed-use ­development project in Tan Phu district of Ho Chi Minh City. Another VinaCapital fund, Vinaland, holds 63.47 per cent interest in the project, but has plans to divest in the near ­future. According to economist Nguyen Tri Hieu, real estate is a special business ­containing many other ­segments alongside housing, such as offices and ­apartments for lease, trading centres, and industrial and ­logistics development, among others. “Many real estate ­developers have proved ­themselves strong enough to be listed on the stock exchange where they can shake hands with other foreign partners to co-develop projects and ­mobilise funds for their ­investment capital flow,” Hieu said. The Vietnamese real estate market is currently attracting different international ­investors. Those from Japan, South Korea, China, Hong Kong, and Singapore are ­dominating, while some funds from the United States and ­Europe have been also eyeing the market. “All of the commercial ­segments are interested, which is different from the past when overseas financiers mostly eyed housing projects. Now they are expanding their interest to ­offices for lease, trading ­centres, high-end hotels, and ­industrial developments,” he added. Chu Thanh Hieu, general director of MIK Homes, said that location is the first things which developers have to think of. “For example, foreign ­developers have been flooding into the west of Hanoi market where the land fund is big enough for large-scale projects. In the coming time, I believe that developers will set up mega urban development areas there,” he said. According to Savills ­Vietnam, apartment prices in cities such as Ho Chi Minh City and Hanoi are generally still lower than ­regional peers such as Kuala Lumpur and Bangkok, despite much stronger growth rates in Ho Chi Minh City when ­compared with these markets. Neil MacGregor, managing director of Savills ­Vietnam, said that the average price across the broader ­market is expected to continue increasing, albeit at a ­somewhat slower pace, with price rises linked to higher ­development standards and continued strong residential demand driven by ­urbanisation, the rapid growth of the middle class, as well as new infrastructure. New home prices in Ho Chi Minh City’s central business districts now average around $5,500 to $6,500 per square metre, a fraction of the eye-watering levels seen in Hong Kong where prices are at all-time highs. MacGregor said, “With many countries also ­introducing cooling measures, resulting in higher taxation, the relatively low taxation in ­Vietnam appears increasingly attractive to buyers both at home and abroad. It is not ­surprising therefore that ­demand for investment ­properties in Vietnam has ­increased significantly since 2015, when the new housing law opened the market to ­international investors. “With the distinct shortage of prime property in Vietnam’s key cities, many buyers can see the potential for significant ­capital gains over the longer term. Whilst in the meantime, rental yields in excess of 5 per cent represent an attractive ­investment versus falling ­returns elsewhere in the ­region,” he added. At the luxury end of the market there is tremendous ­upside and opportunity for long term investment, with buyers set to benefit from potential capital appreciation as Vietnam continues its remarkable growth story. “Although there is still a long way to go for the ­Vietnamese property market to reach the dizzying heights of Hong Kong and Singapore, Vietnam is well on the way to becoming Asia’s next economic tiger, with strong growth, a ­rapidly growing middle class and, for the time being at least, relatively affordable pricing,” MacGregor said. Experts expect the local property sector will continue recording growth in almost all segments, with industrial real estate the hottest in 2019, driven by the relocation of ­factories from China and the positive impacts of trade ­agreements. Nguyen Van Dinh, deputy chairman of Vietnam Real ­Estate Brokerage, expected that FDI in real estate market in the rest of the year will be certainly higher than that of 2018, based on the bright signs of the ­market, such as the lower price of property of Vietnam ­compared to other markets, high profitability, and high ­absorption percentage in ­projects. Economist Bui Quang Tin also expected that FDI into real estate will increase in the ­foreseeable future, with ­diversifying interest from ­housing to ­industrial ­developments, ­trading centres, and offices and apartment for lease. “We have seen a wave of Japanese investors pouring into Vietnam in affordable housing. Among those, Hankyu Realty and Nishi Nippon Railroad have co-ordinated with ­domestic Nam Long Group in a range of housing projects and they are very successful thus far,” Tin said. Discussing the issue with VIR, Steven Chu Chee Kwang, CEO of Nam Long, said that ­Japanese investors are ­always exceedingly ­careful in ­considering any investment. “The reason why those Japanese investors choose to co-operate with Nam Long in developing a range of different projects was due to the ­realisation that the Vietnamese real estate ­market is now thirsty in mid-end and affordable housing, in which Japan can be very strong developers,” Chu said. Highlighting the role of FDI in the real estate sector, Le Hoang Chau, chairman of the Ho Chi Minh City Real Estate ­Association, said that in recent years, real estate FDI has ­usually been of high interest to international investors. “This fact is very important especially when the ­Vietnamese government is ­limiting credit for real estate ­developers. Thus FDI is a supportive investment ­capital source for domestic ­developers,” Chau said. Together with funding in infrastructure development to improve links between ­regions, FDI flow can create ideal ­conditions for developing real estate ­projects. “In 2019, segments of housing, trading centres, ­offices for lease, and especially ­industrial development and ­logistics services will increase,” Chau added.